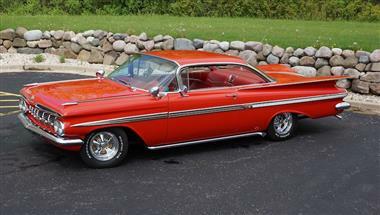 1959 Chevrolet Impala in Franklin, WI for sale. 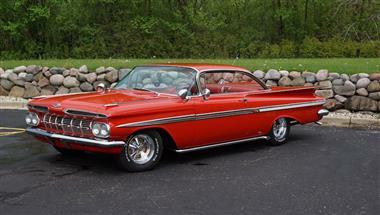 This Impala is absolutely spectacular in Roma Red with a correct red and white cloth/vinyl interior. 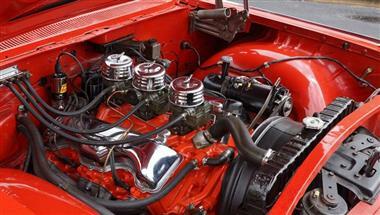 Powered by the rare and desirable 348 Tri-Power engine which was just professional rebuilt less than 200 miles ago. Mated to the 348 is the rare 4 Speed manual transmission on the floor. 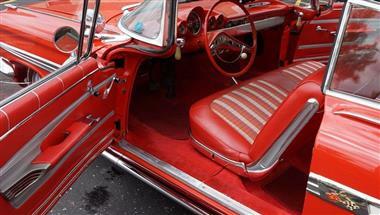 Nicely outfitted with all the fifties goodies like lake pipes, fuzzy dice, and dual spot lights. 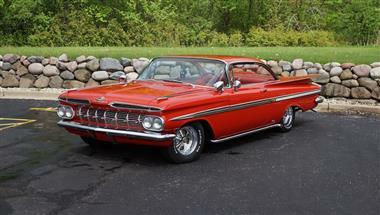 The Chevrolet Impala, now its own series was redesigned for this model year and features the X-Frame chassis. The Sport Coupes also had the wrap over rear window and shortened roof line. 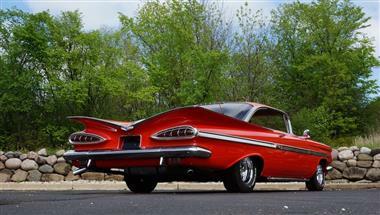 The tail fins went outward, rather than up, taillights were a large �teardrop� design, and two nonfunctional front air intake scoops were added above the grille. These cars were loaded with style and are rarely seen on the market, especially outfitted like this example offered at Valenti Classics. 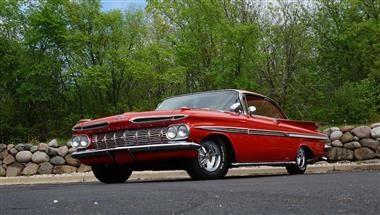 Price Analysis for 1959 Chevrolet Impala. 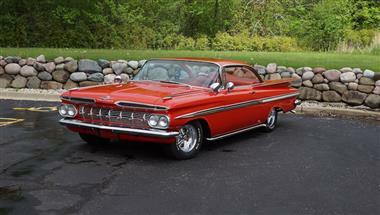 This vehicle is priced $3,189 less than the Average Market Price of $55,537 for a 1959 Chevrolet Impala. This is a Fair Deal as it's priced 6.0 % below market avg. The Pie chart below shows the number of ads within different price ranges.